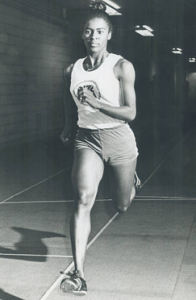 Yvonne Saunders competed at the 1972 Olympics in Munich, representing Jamaica in the 400m and 4x400m relay. At the 1976 Olympics in Montreal, now representing Canada, she participated in the 800m and in the 4x400m relay, where the team placed 8th. She was also selected for participation on the boycotted 1980 Olympics. At the Pan Am Games in Colombia in 1971, she won a bronze medal in the 4x400m relay as part of the Jamaican team. At the 1974 Commonwealth Games in Christchurch, now representing Canada, Yvonne won the gold medal in the 400m and a bronze in the 4x400m relay.